Whew! I finally caught a minute alone to work on a post, unbelievable! Work and chasing after LO has tuckered me out all week. Two nights I ended up passing out super early and sleeping nearly 10 hours both nights. Today I was hoping for an easy day but somehow I still managed to reorganize some of the living room and bedroom. Tomorrow the in-laws will be here to help baby proof, and then later we're going to the park to check out the layout for LO's upcoming first birthday. I'm excited to plan her birthday! I've been wanting to try Bettina polishes forever, and luckily my BF was in Puerto Rico recently and picked up a bunch of them for me. Of course the first one I need to play with is the straightforward purple cream, aptly named Purple. Application was super smooth and easy, and I only needed two coats for full coverage. If this brand ever becomes more available in the states, then watch out Sinful Colors! This is with no topcoat. I thought this shade would be the perfect base color for Sally Hansen's Pink Grape-fruit from the Limited Edition Xtreme Wear Beach Brights collection. 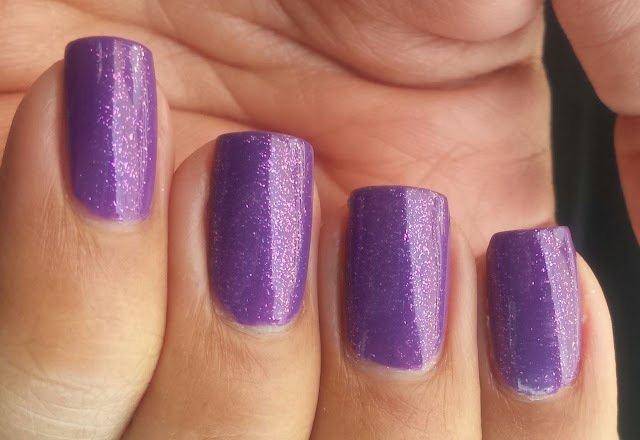 Pink Grape-fruit is a shimmery glitter topper that is too sheer to wear on its own. It's got a purple tinted base with glistening bits of gold to fuchsia shimmer. I used one coat and had no problems with application. It went on smoothly and evenly and I finished with a layer of Poshe. I had a hard time getting the gold shift in the light tent, but managed to capture it while in the car. I thought this mani was really stunning IRL and couldn't take my eyes off the gorgeous simplicity. I haven't worn such a lovely straightforward purple in a long time and the shimmer was really eye catching. I bet Pink Grape-fruit would look great over a variety of colors such as navy or black - perhaps one of those colors would help coax out the gold a little more. I haven't used SH Xtreme Wear polishes in a long time and this was a wonderful reminder how great the formula performs. Have you picked any other colors from the Beach Brights collection?